Mill-Max is pleased to announce the addition of two new large scale spring pins to our family of ruggedized spring-loaded products. 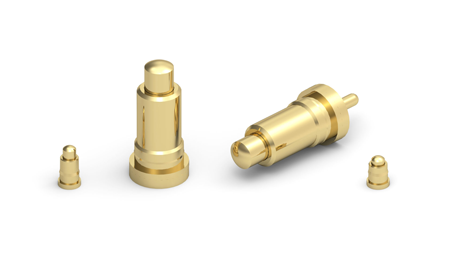 The 0861 and 0871 spring pins have large diameter plungers, bodies and bases to provide the mechanical strength required for rugged applications such as blind-mating of components, drop-in charging systems and quick-connect assemblies where sliding or rotating action is involved. These new offerings are a good fit where greater spacing is required due to electrical and mechanical demands. Both pins feature a .092" (2,34 mm) diameter plunger for a larger interface surface, a .187" (4,75 mm) diameter base, promoting a strong solder joint for stability on the board and thick wall construction to withstand the rigors of demanding applications, especially those involving side loads. The 0861 and 0871 each have a press-fit feature on the body allowing them to be press-fit into housings for assemblies, such as docking stations and battery compartments, or to form module connectors. The 0871 is surface mount; the 0861 has a tail for through-hole mounting providing additional support. Both pins deliver a .040" (1,02 mm) mid-stroke and .080" (2,03 mm) maximum stroke with built in protection against over compression of the spring. Because they are designed and built with the same precision as our miniature spring pins, they exhibit excellent signal integrity in shock and vibration environments. These large scale spring pins feature gold-plated stainless steel springs and gold-plated precision-turned components. With a mechanical rating of 1,000,000 cycles minimum and a current rating of 9 amps (@10°C temperature rise above ambient) the Mill-Max 0861 and 0871 spring pins are the best choice for heavy duty, high reliability spring pin requirements.